Ask any Tuvan today, what the mysterious expression “Huun-Huurtu” means, and he’ll answer “sun propeller” or “sun”. But 15 years ago, when the ethno-group of this name was being born, such a concept was not known in Tuva at all. Not in normal, vernacular language. The musicians themselves explain it this way: Huun-Huurtu is a natural effect that appears when the sun is shining through trees or clouds. Huun-Huurtu is “prosvet”. (Transl. note: can be translated as enlightenment, culture, education, or simply light shining through. HJ.) And that is very symbolic. On a gloomy September day, on a sheepherding station near Kyzyl, we had an opportunity to spend a whole day with the group Huun-Huurtu. It was no wild gathering of fans, simply one of the rare days that the musicians get to spend at home. And even this day was all planned out for filming by Belgian cinematographers. And I think that this interview at least a little bit got on their nerves. But it was worth it. Sayan Bapa. Instrumentalist, vocalist, arranger. Q.: Yesterday (Sept. 10, 2005), you performed in a chanrity concert to help The National Orchestra. Tell me, does not such an European form of an orchestra with its polyphonies break the traditions of Tuvan culture? A.: It needs to be said that we do not know our own history well enough or in enough depth. Let us take our traditional culture: we lived in a family clan system – the aal (aul, ail;). For example, wool was beaten or felted in a group, with the whole collective, or aal, participating. This type of activity created its own rhythm, and the people sang, but not in unison. The singing in such circumstances would also be polyphonic, in many voices. Take, for example, kargyraa, there can be two or even three sounds. And our singing has always been in a group, because if one person sang, the others would join in. As far as The National Orchestra is concerned, they need to return to natural sounds, and for that they have to take the traditional Tuvan instruments into their hands. Today, the orchestra instruments are not sufficiently authentic; they have metallic, European strings, or are completely European. As a result, they are noisy and very loud..
Q.: The more you shout, the more they will hear? Is it some sort of a complex? Q.: Let us return to many-voiced versus single-voiced form of singing. For example, the ensemble of national instruments, “Sayany”, could not get away from a unison performance, when 15, 20, people would be playing the same thing, not trobling to take different parts. Just as they used to play in Soviet times, they continue to do the same thing. In contrast, the National Orchestra does develop polyphony; that is not bad, is it? A.: Possibly. But the “Sayany” conveys the SPIRIT of those times. One cannot deny those times, nor those sounds. And the “Sayany” evoke the aroma, or flavor, of those times. They also performed the works of the venerated composer Aleksey Chyrgal-ool, who preserved the traditional way of thinking, spirit and melodism of Tuvan folk music. But the music that the young National Orchestra plays is not nearly as original as it may seem, because in Asia, from Mongolia to Thailand, that is, with some variations, is what you hear from the street stalls. Pentatonic scale is everywhere, even in Africa. Q.: When can we expet your new album? Q.: Tuvan folk music is not a bottomless well, and so it should be interesting to see what new material will show up in this album. A.: We are very interested in the repertoire of our excellent and famous artists Maxim and Kara-Kys Munzuk. We would like to study their material. And a retrospective of the Soviet times is also very interesting. Q.: Who is who in your group? A.: Without a doubt, Kaigal-ool Khovalyg is the main person of the group, the “frontman”. 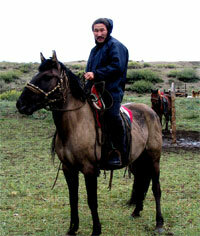 Our friend, Ted Levin, is writing a book about Tuva, and in it, he compares our group to a train. Kaigal-ool is the driver, I am the stoker, that means, I throw in the coal. Another is the conductor, and somebody may even be a passenger. (laughs). In fact, the HHT is an evolving organism. It is in constant motion. Tuvan folk music is the fundament, and the everything else goes in, as we add our vision to this music. Everybody whoever was in this group added something of himself. But in the larger picture, the very nature of traditional Tuvan music is not dependent on human wishes, and we do not lead it, we are being led, or guided by it. For example, the shamans of our culture, before they receive their power, at first they become very sick, and only after that they receive their shamanic powers. (transl. note: the concept of shamanic illness, observed and described world-wide. HJ.) And even in folk music, there are spirits and powers involved. Generally the Tuvans know how to accumulate the entire energy of the traditional culture into a single new whole, to add something of their own, and come up with something new, original, and unlike anything else. Q.: What will you tell all your opponents, who say that HHT over the last years lost its steam, and the music is “running in place”? A.: To European thinking, after all, everything we do is strange. We know very well that we function on a completely different level, because our music is not subject to rational, pragmatic approach. It is the music of feelings and senses. What can one say, even people who do not understand the words like the music. Why should one want new hits to appear all the time, or to have a public hysteria around the group, like, for example, some Beatlemania. There is a paradox: every time at the concerts, we play the same songs, but every time people come, and every time they find new nuances, discover something new in the familiar songs. In the USA for example, after coming to a concert 10 times, they admit that for them, the music always sounds new and different. Q.: How so, when this music must be very foreign to them? A.: The music is not foreign to the Americans. It is also native to them… only forgotten. The pentatonic scale is native to many cultures. But the special characteristic of Tuvan music is that it is clear, simple, short, real, natural, But the main thing is that there are very many feelings in this music! It is, so to speak, physiological, organic! Q.: A quarter of a century ago, when you were in the legendary ensemble “Ayan”, you were also interested in studying and researching Tuvan music. How do you see the past experience today? A.: Yes, in “Ayan” we were concerned with searching the form, attempted to dig, in a way, to the roots. Now I understand that we were searching for what was already within the Tuvan folk music. There are the rhythms, which are from camels and horses. I always become very offended when someone says that Tuvans are not a “rhythmic” people. It was especially prevalent in those times when we were just beginning to play. The understanding of rhythm, in Europe and Asia, especially in Tuva, is completely different. Europeans are used to more straightforward, mechanical, dimensions and rhythms, of the type 2/4, 3/4, or 4/4. In Tuvan music, there is not only that, but also more complicated rhythms like 5/4, or 7/4. From that point of view, we play rhythmically adjustable, or variable, flexible music. Q.: In your view, what is the level of the young Tuvan musicians who play electronic music? A.: Well, the young are trying to “add some coke”. (Note explains to native audiences a daring pun involving the use of cocaine in show business.) All that is superficial. Before you play rock, folk, or a mixture of one or another sort, you should thoroughly know those directions and styles. It is obligatory to know folk music. Look at me for knowing all the genres and their competent use. It especially concerns the mastering of the musical instrument. Dilettantism irritates me! A musician should know his instrument from the beginning to the end! Alas, I do not know any rockers or jazzmen of professional level in Tuva, with whom one could realistically play. And today’s level….. Every time has its own song. Q.: Sayan, since you are so critical towards contemporary Tuvan music, why don’t you, as masters, teach the young ones? Why not? A.: The answer is very simple. There simply physically is no time. I would advise them to listen to many different types of music, as we used to do in our time, to collect material, rummage and burrow in it, analyze, learn it. One must not go horizontally, but in depth. Especially in world music, there is an interesting tendency. Everything is very perfect technically, equipment, sound, performer craftsmanship on the professional level. In music, what is at stake is the “aroma”, (or flavor, odor, fragrance). Because there is not enough emotionality or feeling in the world. Q.: Your re-mixes: is it your tribute to fashion? A.: This does not depend on us. Our music becomes popular one way or another, and the DJ’s themselves arrange it to be more danceable. On the other hand, given a little bit of opportunity, that is, studio time, we can do contemporary arrangements ourselves. Q.: How well do you communicate with one another, as musicians-professionals? A.: On the stage, during a concert, we hear and understand one another with half a word. Q.: So where is the train named Huun-Huurtu going? A.: We are working on the instruments now. We want to return to the real, original traditional forms of Tuvan instruments, to get everything right: from the materials to the dimensions. And then we will get the authentic, inimitable sound, intrinsic to real Tuvan music. Young craftsmen are helping us. The use of European instruments, for example, guitar, adds its own color into the overall sound. We could decide to use others experimentally. That means that those who say that Huun-Huurtu is musically stagnating, are wrong. That is your answer about innovation and experiment. Kaigal-ool Khovalyg. Leader and soloist of the group. Q.: What will you answer to those critics, who say that Huun-Huurtu cannot surprise us anymore, and that you are creatively stagnant? A.: There is no stagnation. We are moving and evolving. Our movement simply is not forward, but back, to the past, to the roots, to the traditions. Q.: In your 1997 album, there was a brave, in my opinion, attempt to perform Tuvan pop songs like “Chadaana” and “Dangyna”. Wouldn’t you like to repeat that experiment? A.: In the song genre, I prefer the works of the respected composers A. Laptan or Mergen-Kherel Mongush. From the young ones, I like the work of Andrey Mongush, because he is close to the traditional. True, one runs into some melismata, elements not intrinsic to Tuvan music, but that is correctable. But aside from that, I would want to do that, to write something very new. But again, there is a problem: we need to find a very good professional bayanist (accordion player). But it is definitely a good idea. Q.: why do you so rarely perform in your own native country? A.: For a very simple reason, the low quality of sound technology. We can do all we can, but the work of the sound technicians is very amateurish, or is limited by the unprofessional quality of the sound equipment. And as a result, the audience will get a wrong impression of our level of performance. They will say “Why the hell do they need to travel all over the world when they are so BAD?” All the more, performing in one’s native country is a great responsibility, one speaks the same language with the audience, and there must not be any weaknesses! Q.: As far as I know, you were always homesick during prolonged absences from home? Have you gotten more used to it? A.: Well, if a Tuvan is not homesick, then there is something wrong there! Since I have been an artist, since the time VIA started the Ayan in the seventies, until today, whenever something like a bit of free time shows up, I immediately head for home. It is no better and no worse. Q.: Kaigal-ool, you travel all over the world so much, you have a good basis for making comparisons. How does your native country seem to you when you get back? A.: I feel pain for my country, but at the same time, I can see it more clearly: there is cattle, and people who strive for a better future, who look ahead. The people have spirit. But we are very inert, we are used to waiting. You can see in other countries that everybody is hurrying somewhere, busy with something interesting, moving quickly because of themselves, or for their family. People are fighting for their daily bread. And here? Always waiting for something, observing. Everybody is trying to leave their village for the city. Who will stay in the villages? Of course I understand that progress is necessary, but at the same time, this civilization has destroyed so much. Here, in the first place, they are very concerned about the economics and material development. But, in my opinion, what is really needed is somebody who would pick up the people’s spirit, to brighten it up with some real ideas. It has to be said that Tuvans are a talented people and learn everything very fast. But leaders are necessary, those who would not destroy the traditions, because one has to hold on to the roots. Q.: What do you think of the proposed project of building a railway into Tuva? A.: In principle, I am against the railroad. What they do not say, I understand, that after the railroad branch is built, there will be nothing left for our descendants. 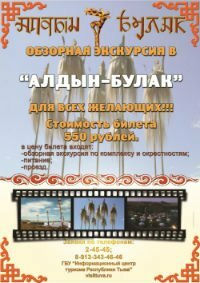 We live in such a beautiful part of the world, that foreigners buy a concert ticket for $25, and right away they want to visit Tuva. Q.: So you are selling the story about magical Tuva? But when they come to visit, they can see that reality is far from that what you sing about, and which they picture in their imagination. What do they tell you about that? A.: They say “Why do you need civilization? Hang onto your roots, be what you are.” But there are others who come and are surprised how filthy it is here. Garbage everywhere. I personally am terribly ashamed of the banks of Yenisey. Horrible picture: the Big River (Ulug-Khem) in the embrace of garbage. Seeing this in the presence of foreign guests, one feels a burning sense of shame. Q.: What can be done about it? A.: One has to be brought up to it from childhood. It was ingrained in our traditions. In every mountain pass, one has a drink and makes an offering to the spirits of the place. I love my “ego”, praise it, coddle it, flatter it, and do not hear any other person, who also has his “ego”. There is no respect or consideration for others, no upbringing. It is remarkable, that in America we give concerts in kindergartens and schools in the mornings, and it is astonishinh how those little chubby kids, are so curious. They ask questions about the group, about Tuva, the instruments, etc. It is interesting to answer them and interact with them. It is impossible to imagine such a scene in Russia. Q.: Where can one hide from envy, or the dichotomy of “ours” and “strangers” ? A.: Our worst national trait, which I cannot stand, is envy. At first they praise you, elevate you to heaven or lift you on a pedestal, and right away, they start hating you and envying you. You do not have to go far for examples, let’s take the wrestler Ayas Mongush. At first, they praised him, lifted him up, and now what? It is not right. He is our national hero. He should be respected. RESPECTED!!! Us, the Huun-Huurtu they also denigrate. “Why, please they go out of the country and live it up on the proceeds of our cultural heritage?! They are selling the secrets of throat singing!! They are raking in piles of dollars! !” Things are always difficult for those who go first, for Ayas, for us, generally speaking. Often very difficult. We literally chop a path through a thick, dark taiga, for those that come after us. Only by working hard, one can prove that it is the right way. At first, it is necessary just to chop through the growth, then there is a narrow path, which is easier for the younger ones to follow. And eventually, see, there is a big, wide highway. Q.: Where do you get the strength? Q.: Honestly, what fears do you have? A.: Complicated question. Cannot be answered simply. The most important thing is to be healthy and not to leave for the next world before one’s allotted time . Everything else one can deal with. Aleksei Saryglar. Vocal, drum , percussion. Q.: Aren’t you tempted to have a solo career, especially since you have all the necessary attributes for it? (won Grand-Prix of the musical contest “Khovu-Aksy-85”). A.: Yes, of course, that idea does not leave me. It would be possible to collect all the musical material and publish it either in electronic or acoustic, folk, form. I am not inherently predisposed to one tr the other style. The problem lies in with whom to do this. To find professional session musicians in Tuva is not easy. There simply are not any. Nevertheless, I want to collect all my recordings. And Sayan and Kaigal-ool will help with advice and work. Q.:How, from your point of view, does the grou survive the difficulties of traveling life? Driving, flying, concerts all the time for half a year at a time? You are like astronauts in orbit? A.: The beginning and the end of the tours are tho most difficult periods. To get into the rhythm at the start, and into a suitcase frame of mind,, that is difficult but not insuperable. On then way back, as soon as we get to Russia, everyone goes his own way: somebody goes home, another may stay in Moscow, depending on various plans. Q.: And how do you overcome the various stresses and conflicts, unavoidable in a group stuck together for a prolonged time? A.: We try to solve the conflicts gently. We are used to each other, and know our “idiosyncrasies of national character”. Q.: And the youngest of you, Andrey Mongush, how did he adjust to the group? A.: Normally. Any collective or group depends on discipline and order. Especially during concerts. A.: If you mess up during a concert, play badly, or not exactly as it should be, such a case is not allowed to just be passed over. Calmly, after the concert, in our own narrow circle, we go over it, analyze and discuss who did what and how. Q.: What will you tell me about Mongolian musicians and their behavior towards you? It has been said that there is ancient competition between Mongolian and Tuvan musicians, in everything concerning tradition. Seriously, did you cross paths with them at concerts or festivals? A.: Generally they behave well towards us. They come to the concerts, show respect. At the same time, all the Asian groups in the West perform at very similar level. But the Mongols, I noticed, quickly adopted the Tuvan throat singing; they use the same instruments, grouping. Everything is the same, except it is in the Mongolian language. Q.: Many think that money comes easily to you. Is that true? A.: It is not simple to make our daily bread. You are traveling, and that means that always, you have to be in good form physically. God forbid if you get sick! In the West, everybody and everything always works according to schedule. You must not be late! You get used to it, one way or another. At home, the time flows, without hurry, slowly. With living and food, it is all right, there are no problems. After all, we are not such a popular group like Madonna or other Western stars, but nevertheless, the sound-check is very serious for us, and, in accordance with our “rider”, the organizers have to make certain that the conditions in the concert area are correct as specified. Every musician expects good concert sound and does not want to be deceived in his expectations. It needs to be said, concerning sound, that in the West, there is very strict, narrow specialization. There are sound-technicians specializing in every direction and style. Some for acoustics, like, for example, folk music, others in electronic music, jazz, rock, rap, etc. It is difficult, but one gets used to it. In the West, the sound operators and engineers practically pray to the musicians. Their level of professionalism has a direct bearing on their further career. Everybody is terrified of losing their job. I just remembered one situation. Once they set up our sound like for a rock group. You hit the drum, the walls shake. Well, and the kids, the sound technicians, just sit there on the side. Over all, this is not our sound at all. Then Sayan, as the one most proficient in English, calmly, but at the same time firmly, made them understand how it should be set up. Everything was smoothed over. I repeat again, bad sound at a concert wastes everybody’s time. It kills everything. We record practically all the concerts. An incredible amount of audio and video material has accumulated over time.. We need a good, literate specialist to go through it and bring in some order. Q.: Is the pay better at festivals or at solo concerts? A.: The festivals pay according to status and contract. The Huun-Huurtu has a certain status in the world of western show business, and the work is paid accordingly. The festivals, not mentioning the variety and that, in a way they are a collection of concerts, it is always useful from the point of view of advertisement, connections and creative interchange. Festival is a market. And since it is a market, we are free to choose places which are in their way advantageous or interesting for us. Sometimes a festival is attractive because of the money and not the music, sometimes the other way around. And there is a very different situation, when the festival is very poor, but at the same time very spiritual. As far as the pay is concerned, economic principles are in force. Everything depends on the CWP – “Coefficient of Working Participation”. How much work or spirit you put in, that’s how much you’ll get. That is an indelible principle for concerts and for the albums of the group. Q.: What do you miss during the tours? A.: Fresh, clean air. As far as the cuisine is concerned, we always look for something close to Tuvan – Turkish, Japanese, Chinese, Korean, etc. When the body feels a meat deficiency or deprivation, Chinese dumplings come to the rescue. To my taste, European cuisine is bland and dry. Q.: I heard that you collect musical instruments. A.: Yes, I have a small collection. I am a percussionist, and for that reason, there are many percussion instruments in my collection, from African bongos to Indian tabla. Well, I collect some wind instruments, too. Q.: An indelicate question. During these prolonged tours, away from your loved wives, how do you, adult, healthy men, deal with natural urges, you understand what I mean. A.: (Laughter). Our secret weapon in those situations is abstention! (Laughter again.) Well, after all, what else? We simply return back home more in love with our wives than before! Q.: But such a popular group like you, you must have some female admirers? A.: Yes. We talk to them. But it does not go beyond that. Q.: Aleksei, and how is your English? A.: I can say that on every trip I learn another new expression and remember another word. (Laughter.) At first, because we did not know the language, it used to be like this: we are standing in customs, they are interrogating us about the purpose of our trip etc., and we are silent like captured guerillas. Then Sayan comes to the rescue, shows up and disentangles the situation. But now we all are up to par with basic Rnglish. In Greece, where we go very often, they already know us at the airport and send us through without any delays. Q.: Where do you like to go? Which country is the most comfortable? A.: (Thinks.) Really, I have to say Germany. The most economically developed in Europe. One feels very free and comfortable. People are not aggressive. And discomfort…….. one feels that in the countries of the former socialist block. Including Russia. The difference is very obvious in the services. Q.: How do you evaluate the level of Huun-Huurtu? A.: I believe that we are still in a stage of development. We still need to work and work. And then, in the West, we tell them that we are not the only Tuvan music group. We tell them that there are other talented masters, like Kongar-ool Ondar, groups like Chirgilchin, Alash, Salgal, etc. We tell them – come to Tuva, go to concerts. DO not miss any concerts in your area, if somebody from Tuva shows up. Q.: And how do they accept you in Russia, for example in Moscow or Petersburg? It is no secret that they noticed you only after you gained recognition in the West? A.: Yes, Russia, they are just barely waking up. We were quite astonished that they know us at all. And that we are quite popular in Moscow and Petersburg. For Russian musicians, our music is something new, fresh, and now, happily, no longer exotic. Q.: How do you survive the long absences from your native country? A.: When I get homesick, I feel so awful that I do not know what to do. My faithful igil comes to the rescue. I take it in my hands, and sing all the songs I know and remember. Sometimes even tears start pouring. Then I go outside, take a walk, and the homesickness is over. One feels filled with energy again. It used to happen to me before, when I worked solo. Now, since I have begun to travel with my older brothers (the other HHT members), it can be simply devastating. At other times, words pour out. They accumulate and come out. I saddle my pen and paper. I write it out., and right away I take it to Saryglar, and I ask him – look, how is this? And he answers – OK.
Q.: it seems that you share these creative attempts only with Aleksei? A.: Well, after all, we are always paired up. The youngsters, so to speak. And the melody shows up a few days later. You see, one thinks about it, but then it shows up quite suddenly. For example, the song about shepherds showed up like this. It is abou how after eight years of wandering, I come back to my native place Manchurek, where we had our summer camp in the middle of the green taiga, and it is deserted and abandoned. I remember, when I was a child, therewere so many aals in the area where I used to herd sheep. Even the famous khoomeiji Khunashtar-ool Oorzhak used to be in that area. I used to listen to him and learn throat singing from him. And in that song, there are words to the effect that we exchanged the taigas and steppes, dear to our hearts, for the deceptive lights of the cities. And your native place is crying, alone, deserted and abandoned – the place where you were born and grew up – and it is waiting for you to come back, waiting in vain. Q.: Before you joined the Huun-Huurtu, you were quite a popular singer and musician in your own right. What does the Huun-Huurtu mean to you? A.: Without any exaggeration, to play in the same group with world-class musicians is great honor for me. To be honest, I never dreamed that I might one day play with them. Thanks to them, I have seen much, heard and learned much. When they made me the proposal, I was quite shaken by it. Q.: When you are out in the West, how do the fans of Anatolii Kuular, whom you replaced, react to you? A.: They often come after the concerts, ask about him, and sometimes, at first, would even mistake me for him. The others would explain what happened. I think that Anatolii Kuular’s contribution to the fame of Huun-Huurtu would be difficult to overestimate. 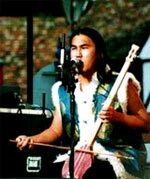 Q.: In the early 90’s, thanks to the Huun-Huurtu, the songs of Tsengel Tuvans of Mongolia became popular. What other discoveries, in the ethnographic sense, can be expected from the group? A.: There is a large accumulation of material. It needs work. I also think that it would be productive to dig through the archives of the Institute of Humanitarian Research, archives and collections of the Museum, and why should one not look for material even on the radio? 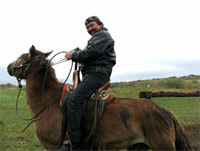 It is possible to work right here in Kyzyl, without going out into the field. Q.: There is a point of view saying that Tuvan folk music is not a bottomless well, and that the Huun-Huurtu has been just scraping the bottom of the well for a long time. Is that true? A.: The Huun-Huurtu has its own set-in style and manner of performance. But there is a saying: Time does not stand still, and the colt grows up into a horse. Something may change. It depends on the older ones. Q.: Well, and you, the young, green one, where do you think the group is going? A.: There are many roads and they are all different. But the foundation is – this is folk music. If, for example, we would play with jazzmen- people will hear ethno-jazz, and if with folk musicians, it will be world music. We played with the Indian musicians “Trilok Gurtu”, and we even played with Koreans. We even played with Christian, the star of Swiss national singing style “yodel”. And Tuvan music always sounds fresh and interesting. It only confirms the opinion that folk music never gets old. P.S. As this material was getting ready for publication, there were changes in the Huun-Huurtu. Instead of the well-known young musician Andrei Mongush, another, no less popular and professional musician, Radik Tyulyush, joined the group. The reason was that Andrei Mongush decided to set up his personal life, continue his solo career,, and to teach, naturally using his experience with the Huun-Huurtu. After one year, after the rearrangement of the group, we decided to interview the new group member, Radik Tyulyush, to take a look at him in the light of The Huun-Huurtu. Soloist of the rock-group “Uer”, worked in the ethno-group “Yat-kha”, and until he joined the Huun-Huurtu, he was a musician and director of the National Orchestra of the Ministry of Culture of the Republic of Tuva. Q.: Why, in your opinion, did the Huun-Huurtu propose to you to work with them? A.: I can’t even say. Of course I agreed to an offer from such a famous group. Basically, this offer completely changed my whole musical and creative life, because I came from outside the folk music. To come to the roots from outside can result in an extremely interesting effect. It is a great responsibility for me, because great hopes were put in me, and it was up to me to elevate the class of the group, not lower it. Q.: What do you mean by coming in from outside, when you have the xperiences from rock group “Uer” and ethno-group “Yat-kha” under your belt, as well as the National Orchestra. In the last two, as is well known, you performed folk music? A.: Yes, of course, I worked in these or other groups, but, to be honest, I did not really feel the roots. Q.: And what, according to you, are the roots? A.: Everything around us has its roots. To look from the surface, we perform ancient music, of our grandfathers, on authentic instruments, in our old national costumes, but that is still only the surface. When you look inside, them because we really are contemporary people, in that old music we find all the contemporary styles and directions. To me this music is contemporary. From that there follows a simple conclusion that Tuvan music, with its roots, feeds all contemporary music – jazz, rock, etc. Q.: Characterize the people you play with now. A.: Each of the has his own personality and individuality, and, naturally, has a different influence on me. For example, Kaigal-ool - he is a person who grew up in the countryside, in the middle of nature, with all the natural sounds; I would say that he is the most authentic one of all of us. Compared to the others, he is unique by being “saturated,” soaked through, with this music, its rhythms and sounds. When he startes to sing a song, which I know and can also sing, it always sems to me that he does it more correctly. The song comes right out of his insides. I can feel it. I got the music from discs, and because of that, I want to, strive to, learn from Kaigal-ool. Sayan - he is a contemporary person, played different types of music, he is closer to me. He also feels this music well. To compare them to a tree, Kaigal-ool is the roots, and Sayan is the trunk, striving upwards, but needing the roots for support. He is the brain of the group. Aleksei is the same type of a Tuvan, who knows folk music and contemporary music, and this knowledge in practice becomes parallel, in its logic and thinking. Q.: How is a new composition born in the group? A.: A new song, I have noticed, is born from them. Q.: It is strange to hear you say “from them”; after one year, you still do not feel as a full-fledged member of the group? A.: Yes, “from them”, because after a year of playing with the group, I still do not feel completely in harmony with them. It is necessary to assimilate organically, and for that there has not been enough time. Q.: Let’s go back to the composition of songs…..
A.: Yes. The process is very interesting. When Kaigal-ool starts to sing, and most of the time this happens during a sound-check, all the others very quietly tune in with him, without any prior agreement. Then they start to play that song, and put in everything they have been thinking about since they played it last. And that is how the work on a song starts, where to tighten something up, where to subtract, where to add more, etc. And after that it is still necessary to play it many times before it is ready for public performance. Q.: Last year, there was talk about a new album in preparation. What stage is it at? A. The work goes on. One has to “live into it”, to put in a lot. Especially for me personally, it is a great, very serious work. You have to put in a lot of yourself, add, and at the same time no to mess up the sound of the group, which has been formed over many years. Of course, I consult with all of them. I have been trying to understand and to catch up with them. One has to think and ponder a lot. And to this time, I am still in doubt: Can I really be worthy of this music, to live up to it? Q.: The others also talked about the necessity of discipline for cohesiveness of the group, and that one has to always be prepared for a concert? A.: Yes, that is so, and especially for musicians going to foreign countries. But, in my opinion, the impression one makes on the audience is very important. Well-played concert gives one a feeling of satisfaction, which is very important for any musician. Since I’ve been playing with the group, more that half of the concerts have been of this kind. Q.: After a schooling like this, if you go back to your rock’n’roll beginnings, your music probably won’t be the same? What will you bring from this experience? A.: Melodiousness. And, naturally, throat singing, without it – no way. And if I play rock, the most energetic and aggressive of styles, I am sure that in my rendition it will become gentler and nicer, in music and in text. Q.: And what do you think, are you “leading”, or “being led” by this music? A.: I personally compare this music to a fluid element. If you are floating or swimming in it as a foreign body, sooner or later it will throw you out. If you start thrashing about, you will get stuck in the middle of the river, against the current, the water will either throw you out on the shore, or it will break you. One simply has to become a part of that stream. I am beginning to understand a lot more about people. I find peace and goodness. The ancient music gives me the strength to give meaning to myself and to the world. Huun-Huur-Tu is the enlightenment which shone through the thickness of snobbery in the West and incomprehension in Russia, as well as the historical and cultural ignorance of Tuvans themselves. Finally, this is the main and most important achievement of Huun-Huur-Tu, because there is nothing more serious and important than to return a long-lost sense of one’s own dignity to a whole nation, even a small one. Huun-Huur-Tu – this is not a railroad train but a caravan; and , unlike in their “Song of the caravan drivers”, which traveled only along the Great Silk Road, this caravan travels over all the continents. And in the bigger picture, it is not important who came and who left, but that the caravan goes on and on without stopping.